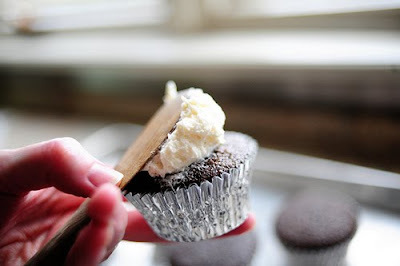 I just stumbled upon one of the greatest frosting recipes... ever! And, of course, I had to try it. If you have a few minutes (and that's all it takes to make this) you should humor me and check it out. And if you have some chocolate cake handy... glob this on. It's just about the best darn thing ever. In fact, it's called: "That’s the Best Frosting I’ve Ever Had!" Here's what you need... and I'm sure you've got it in your kitchen. I did, so you must. While the mixture is cooling, cream the butter and sugar together, on high, until light and fluffy. Then add the cooled milk/flour/vanilla mixture and beat until it all combines and resembles whipped cream. I didn't even bother with the cake. I mean, why?